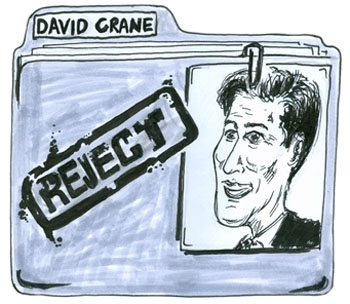 The flattering article on David Crane that appeared in the Daily Cal on April 22, "Controversy surrounds appointment of UC Regent," gave surprisingly short shrift to those opposed to Crane's appointment. While the reporter contacted me for information about the number of people who signed the Berkeley Faculty Association's petition opposing Crane's appointment (1,475), he did not ask to interview me or any other officer of the BFA, and none of our concerns about Crane made it into the article. The article quotes Crane saying, "What I'm focused on is ... maintaining access and [the UC] remaining the finest public university system in the world." We all support that idea. The question is whether Crane is going to get us closer to this goal. Not likely. According to the article, "Crane considers finding alternative revenue streams - rather than focusing on organizational efficiencies - paramount if the university is to maintain its excellence, access and affordability." Yet Crane never identifies any source of alternative funding beyond a vague reference to the Medical Schools as assets. He has no interest in reducing outsized compensation for top administrators. Why isn't this kind of cost control a part of any strategy to balance the university budget? Crane advocates that pensions now provided by defined-benefit (DB) plans be converted to defined-contribution (DC) plans. While this would produce paper savings for UC, it would cause existing unfunded liabilities to snowball without relieving the university of its legal duty to fulfill its accrued obligation to existing and future retirees covered by its existing DB plan. Worse, it would make UC's salary and benefits package less competitive, further undermining its ability to recruit and retain world-class faculty and staff. The fact is Crane is very much like many of the other Regents in background and outlook. Eight of the eighteen publicly appointed Regents made fortunes in the financial sector - David Crane would be the ninth. From 1979 to 2003 he was a partner in Babcock & Brown, a firm specializing in real estate derivatives that once was worth over $9 billion and went bankrupt when the real estate bubble burst in 2008. Reporter Peter Byrne recently wrote an award winning 8-part report identifying a multitude of potential financial conflicts of interests on the part current Regents who oversee the University's investments (see http://spot.us/pitches/337-investors-club-how-the-uc-regents-spin-public-funds-into-private-profit/story). Even as a Regent-designate, Crane has taken a lead in pushing the financial sector's agenda against the interests of all others. If confirmed, he will be another Regent who views the challenges facing the university through the narrow lens of finance and privatization, the very approach that has helped get us to the sorry state we are in now. California's Constitution foresaw that wealth and political connections could contaminate the Board of Regents. That is why Article 9 section 9-e defines a twelve member advisory committee that the Governor must consult when naming a candidate for Regent. This process was not followed in Governor Schwarzenegger's 11th hour appointment of Crane. California's Constitution also provides that "Regents shall be able persons broadly reflective of the economic, cultural, and social diversity of the State" (Article 9 section 9-d). But there is no one on the board with experience in what the university does: higher education, research and hospitals. Where are the professors, the scientists, the doctors? Where are the humanists and public intellectuals? Governor Brown should rescind Schwarzenegger's improper appointment of David Crane and utilize the Constitutionally mandated procedure to select a better candidate. If he won't do this, the Senate Rules committee - which by law must confirm appointed Regents - should reject Crane and demand that the Governor nominate a better candidate using the legally required method.